Once upon a time, in a land filled with ice and snow, there was a Bosch dryer that was squealing like a… well, like a dryer when something’s wrong. In addition to the squeal, the dryer would make an undulating RAT-A-TAT-TAT sound as it ran. 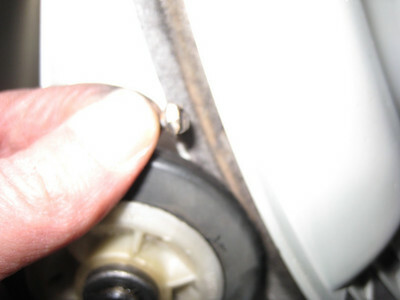 So the parents of this noisy dryer went online and found that Samurai Appliance Repair Man makes housecalls! Their squeals of delight drowned out the loathsome squealing from their dryer as they called the Samurai. Seconds later, the Samurai was on the scene ready to do battle with another appliance that has refused to fulfill its design function. This dryer tears down differently from most. Pray to St. Applianopoulous, the patron saint of appliance techs, that you don’t have to do any repairs on this dryer for which you need to remove the front panel. I pity the fool who has to remove the front panel. You would need to remove the front panel for things like the front bearing, fan, door switch, and gas valve (on gas dryers). But St. Applianopoulous heard my prayers and I only had to remove the back panel and drum. 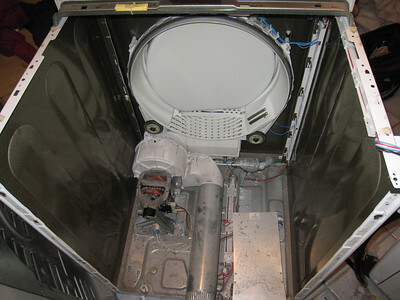 Fortunately, most repairs on this over-designed, over-blown, puffed-up dryer can be done from the back. But, in typical Bosch fashion they had to do it differently from everyone else. In this case, Bosch hired an engineer with a screw loose who designed this dryer so that you have to take out a bizillion screws to remove the back panel. Fortunately, I had my trusty DeWalt driver. You better git you one, too, or you’ll be back there for three hours just removing screws. OK, maybe I’m exaggerating a little bit… but just a bit. With the drum out, I had good access to all the rolling components: motor, idler pulley, belt, rear drum bearing, and front drum rollers. I spun the front drum rollers to make sure they were quiet. They both spun freely and smoothly. So I warmed up that cholesterol-based compooter betwixt my ears and calcumulated that the front rollers could not be the source of the ratcheting noise. Long, drawn out squeals mean that something is scraping or rubbing during the entire revolution of the drum. But what could it be? Here’s where my decades of accumulated appliantological wisdom not only gave me The Edge, but pushed me right over it. You see, Grasshoppah, the left drum roller (as viewed from the back) has a small gap between it and the front panel. Turns out that gap is just the right size to catch little nik-naks left in pockets, like screws. So I stuck my favorite finger back there and… behold the screw! Folks, I am not making this stuff up– this is a real-life Appliance War Story. And you can take that to Lehman Brothers bank! keen, Vulcan squinties to the idler pulley. One flick of my favorite finger proved that its useful service life has ended because it would barely roll. 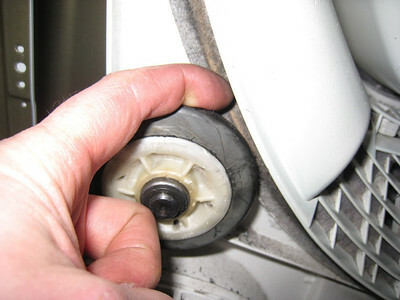 I replaced the idler roller with a new, upgraded roller, shown here. So I slapped that puppy back together and they all lived happily ever after. 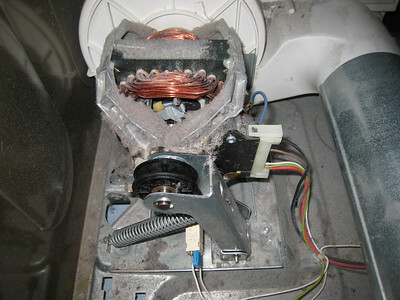 This entry was posted in Dryer Repair on March 11, 2009 by Samurai Appliance Repair Man.